If this sounds like a lot of features for no money, you are absolutely right. In this post, I am telling you what I use Diigo for and what setup (browser, apps) work best for me. So if you haven&apos;t heart about Diigo before, this post is absolutely for you. And if you are already a Diigo fan like me, keep reading: I am sharing some cool tweaks in the settings menu that make Diigo even more awesome. Diigo is an incredible versatile tool and will help you with most of your needs. For some, this might include sharing their bookmarks and annotations, or exploring what other people are saving into their Diigo library. However, I am not really using Diigo for discovery and sharing. Maybe I should, but I believe that services that are linked in with twitter, facebook and pinterest are much more suited for this. Simply because they are more widely used. However, your milage might vary, especially if you invest some time into building your social network with other people on Diigo (see my upcoming post on Diigo for power users – coming soon). I am using Diigo foremost in "private" mode: as my own personal internet library. Call me anti-social if you like, but I am not a big fan of people knowing what I am highlighting, Since these are often related early research interests of mine, I want to rather keep my highlights under the covers. Diigo lets me keep my stuff private, which is great. So what can you use Diigo for? Whenever I am reading an article that I think might be helpful sometimes later, it goes straight into my Diigo database. It might be about a phenomenon that I am interested in exploring with future research, or something I want to write about on academiPad some day. I quickly highlight passages that are most relevant, which automatically adds this page to my database. In addition, I assign some tags so that I can easily find this page when I am coming back to the topic. 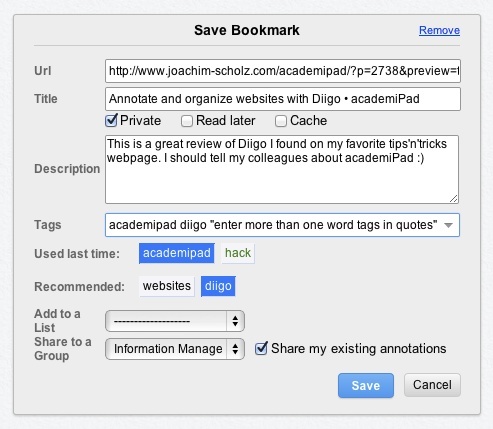 Diigo will recommend some tags based on the content of the webpage, and it also remembers what tags you used last time when saving a bookmark. But it gets more awesome: In Chrome, Diigo also suggests previously used tags when you start typing. That&apos;s pretty cool, and a good reason why to use Chrome as your primary browser. I will discuss some more differences between Diigo in Chrome and Firefox further down. One thing I am trying to push myself to is to do one task at a time. I call this mono-tasking. As a grad student, nobody except myself monitors my time or what I am doing with it. And in order to not fall into the rabbit hole of reading one story after another, I save articles I am coming across during the day in Diigo&apos;s Read Later folder. There is a custom bookmark that lets me do this nice and easy, or you can use the menu in the Chrome extension / Firefox toolbar. As a third alternative, you can add pages to your Read Later list via the context menu. At the end of the day, or whenever I have time to catch up, I can visit my Read Later list either from the Mac or on my iPad via the free Diigo Browser. Check further down for some extra tips on how to make adding and accessing stuff in your Reading List even easier. Because Diigo can cache webpages, it is also a great tool to do primary research. Caching a webpage basically means that you save its current state to the database. So even if the webpage changes or goes offline some day, you will still have the exact same webpage to work with as when you saved it. Obviously, this is really important when webpages are a primary data source for your research, for example when you are conducting a content analysis on a discussion board or a visual analysis of a corporate webpage. Highlighting and assigning tags to cached webpages are great tools to analyze this data for your research. However, if you are planning to use Diigo for primary research, you will probably need the Premium Plan ($5/month or $40/year) to unlock unlimited page caching and screen captures. 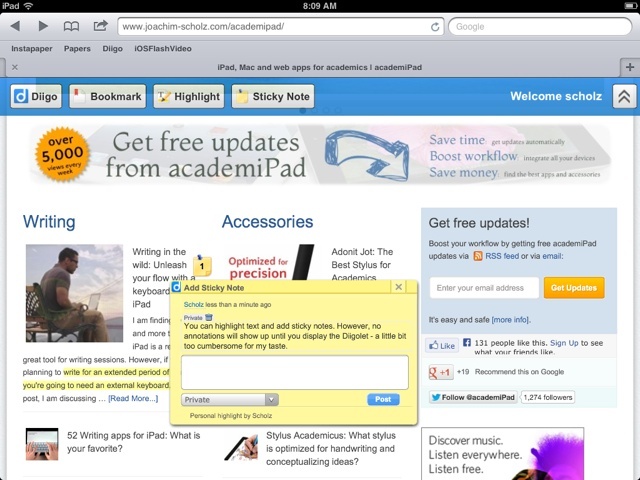 In this section I describe what different tools I am using with Diigo on both Mac and iPad. The short version is: Use Chrome on the Mac to leverage the power of extensions, and use the free Diigo Browser on your iPad to take your Read Later list to bed. I was on the fence what browser I should use for quite some time. While Safari isn&apos;t the best browser anyways, its almost complete lack of Diigo tools broke the straw for me; nowadays you will hardly find me on Safari. Both Firefox and Chrome have decent support for Diigo. Spoiler alert: I find the integration with Chrome slicker and more comprehensive (Google search support), and this is why I adopted Chrome as my primary browser. Let&apos;s look into the differences in a little bit more detail, because there are a couple of settings that can make your Diigo experience even more awesome. 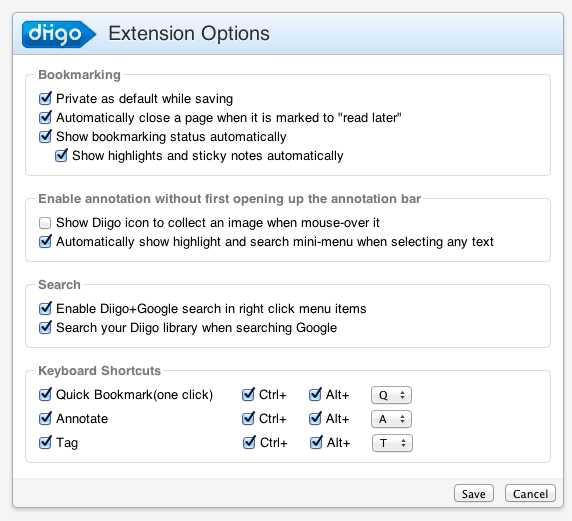 Firefox has an advantage in that the Diigo add-on installs a toolbar that gives you instant access to all Diigo features. So if you prefer to have all options clearly laid out, Firefox is a better browser for you – at least when it comes to Diigo. Chrome, on the other hand, operates via an extension button and a somewhat less cluttered (but also less comprehensive) floating menu for annotating webpages. It still offers most functions, and in my opinion Diigo looks a little bit more polished on Chrome. On the right side of the picture above (click to enlarge), the "private" as default checkbox is an important one you might want to enable, depending on your own taste of how much transparency is too much. Another great feature to enable in the "Toolbar and Menus" tab (left side) is the second checkbox, "Show drop-down menu when text is selected". I highly recommend to enable this, because it makes annotating so much faster. The first checkbox in the "Bookmarking" box and the second checkbox in the "Enable annotations…" box do the same as in the Firefox version shown above. Also, note that the very handy "Keyboard Shortcuts" are also available in Firefox; you will find them in the "Miscellaneous" tab. There are a couple of features though in the Diigo for Chrome settings that you won&apos;t find in Firefox, and this is the reason that Chrome became my browser of choice. You heart right: Google&apos;s Chrome, not Apple&apos;s Safari, is my default browser, and I don&apos;t even use Gmail! All because of Diigo, this is how much I am a fan of this web annotation service. There are two Diigo features in Chrome that sealed the deal for me: First, you can set Diigo to automatically close a tab or window that you have sent to your Read Later list. This only works when using the right click context menu or the extension button, not with the Read Later Bookmark that you can place in your Bookmark Bar. Unfortunately, Chrome groups context menu commands for the same extension in a folder, so the Read Later command is a little bit tucked away in the context menu. I know this counts as a first world problem, but if you want a slightly easier way to add pages to your Read Later list, another Diigo-enabled Chrome extension called Read Later Fast is ideal for you. It adds its own, more accessible context menu command, and you can also set a keyboard shortcut for sending tabs to your Read Later list. So how fantastic is this? All I have to do is to hit "Control + Shift + L" (customizable), and PUFF! – the tab I was just on is closed and safely tucked away in my reading list. Read Later Fast also has its own reading interface in Chrome, which is more lightweight than Diigo but obviously lacks Diigo&apos;s tacking functionality. However, I go through my Read Later list most of the time on the iPad – see below. The second, more important reasons why Chrome is the best browser when it comes to Diigo is because you can integrate your Diigo library with all your Google searches. I highly recommend to keep the two checkboxes in the "Search" box of the settings enabled. Whenever you search something in Google, you will be notified if anything that matches your search query already exists in your Diigo library. There is a little delay that sometimes irritates me (because I am already clicking on the first line and then the window changes and I click on Diigo instead), but having such a convenient way to know that you already have something similar in your library is well worth it. So go on, install the Diigo extension on your (now) favourite Google Chrome browser, and make the web your own. The iPad is a little bit Diigo&apos;s Achilles heal. Why I am a huge fan of Diigo&apos;s web services, the folks over at Diigo are excruciating slow when it comes to rolling out decent companion apps for iPad and iPhone. Your best choice is to totally ignore the Diigo for iPad and Diigo for iPhone apps for now. First, you can install Diigo&apos;s Web Highlighter for iPad Safari to get the exact same web annotation and organizing functionality onto your portable device. What it does is adding a little bookmark into Safari on iPad (or another browser on the iPad). Tapping on this bookmark will bring up what is called the "Diigolet": a small tool for highlighting and tagging webpages not unlike what you are getting in Chrome. I totally recommend doing that. It requires a few steps, but the linked webpage above does a good job explaining what to do. And it is always good to have the option to quickly tag some webpage while browsing on iPad&apos;s Safari. One problem with this Safari-addition is that you won’t see any annotations on a previously bookmarked page until you display the Diigolet. And once you jump to the next page, the Diigolet is gone and you have to display it again in order to keep highlighting. For me, this is way too effortful. It’s still good to have the Diigolet installed to have it ready when you need it, but in my opinion, using the Diigo Browser as your default browser is the by far better option. Second, you have to check out Diigo&apos;s other free app: Diigo Browser (iTunes link). It might take you a little while to get used to this browser, but after a while you will find that it is an amazing app. Heck, it might very well replace Safari on my iPad altogether. 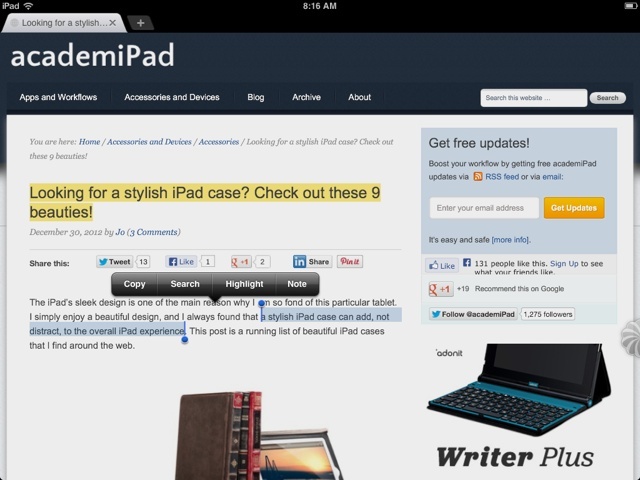 As you would expect, Diigo Browser tightly integrates with Diigo and lets you easily highlight and annotate webpages. Like in iBooks, Papers or Sente, simply select text and choose "Highlight" or "Note" to annotate this passage. I haven&apos;t found a way to change the highlighting colour or to add sticky notes that float around on the webpage. It would be nice if this functionality was added some time, but its not a deal breaker, especially since Diigo Browser is free anyways. And there is a lot of more stuff why Diigo Browser might easily replace Safari on your iPad: Incognito mode, MultiTouch Options, Desktop Browser mode, and, drumroll… Ad Blocking! Again, Diigo Browser might take a little time to get used to, but it is so feature packed that it is well worth an extended try-out phase. If you like Diigo, and you will like Diigo if you are into information management, this app is a jewel. Diigo is an amazing platform for organizing the web. Getting started with Diigo is really simple, but once you dive deeper into its sharing and collaboration functions its getting complicated pretty soon. You are not alone in this: I will talk in upcoming posts about how Diigo fits into your overall information management workflow and what tricks Diigo power users can use, so make sure to follow academiPad via email, RSS, twitter and/or facebook. But try it out for anything between 5 minutes and a week, and I am sure you will agree with me: Diigo is one of the best information management tools out there. If I could use only one web app until the end of my days (or the end of the internet – whatever comes first), I would choose Diigo. To answer your question about how did people do research before the Internet age – it was slow, laborious and quite costly. Imagine having to phone or write to book needed articles, books, journals weeks in advance. Or spend a complete day travelling to your nearest decent library to painfully trawl through books, take notes or spend what was quite a lot back then to make copies. You had to produce well written and presented letters to people you might want to interview for your research and then wait patiently for their reply. You had to join a long list of people waiting for the recommended text books you could not afford and allowed maybe three days before you had to give them back. And you had no choice but to spend a bloody fortune on books/journals. This wasn’t the Victorian age by the way, I’m just going back 25 – 30 to my student/ Masters days. I hope you lot know how easy you have it in comparison – but then again, I struggle to make the new technology work effectively for me and still feel more comfortable with ‘real books’. Great article…thanks for sharing. I agree that it’s nice to have the option to use Diigo in “private” mode for personal use. My only problem with Diigo browser for ipad, is that it is very slow in downloading the read later items from my diigo library read later list. Sometimes the browser just stays for 10 minutes trying to download some items. Sometimes when diigo browser is closed and reopened again the already downloaded items for offline should be redownloaded again. I cannot depend on a read it later service like this. Comparing to pocket, this is way less reliable. Other diigo services are awesome and i am a big fan for them. Just is little but important problem. 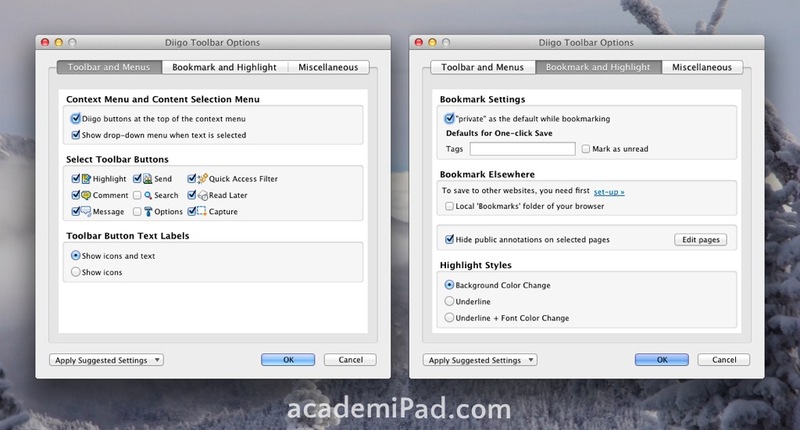 Diigo browser can highlight and bookmark even in offline and even after closing the app and returning to it when going online it will update my library with the highlights and bookmarks done offline. AWESOME! Just if the read later feature in diigo browser was reliable enough, i would leave offline reading in pocket . Any comments from your experience about this?